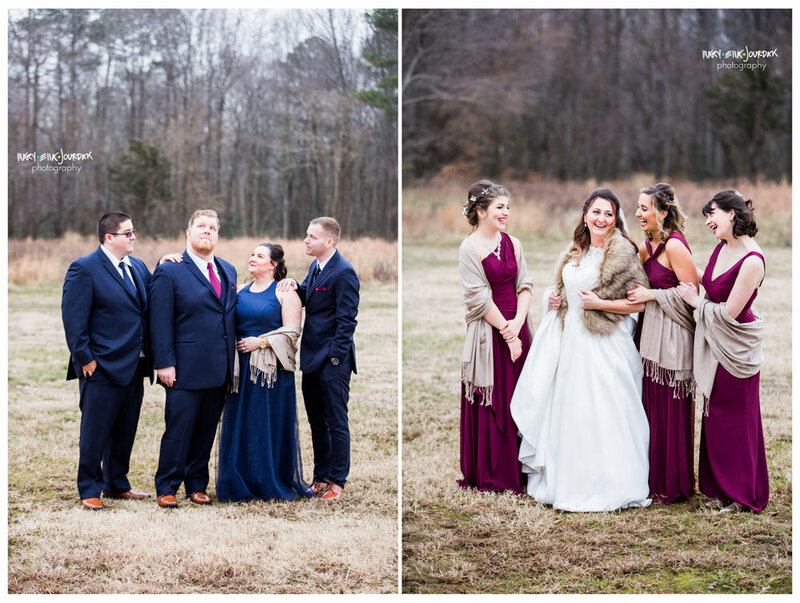 Maybe it’s because I don’t get to do a heck of a lot of winter weddings, and maybe it’s because it’s such a fabulous break from the winter blues to have so much love and sparkly light condensed in to a day, but I just can’t get enough of the cold weather I-Do’s. Bobby and Nichole did the dang thing SO RIGHT, and I was beyond enchanted by every moment of their day for so many reasons. Firstly, the venue they picked was a place I’d driven past probably a hundred times and never suspected just how rad it was. Along the highway, the Old Sale Barn looks like a pretty sizable antiques store. Inside? Oh boy. There’s an auction floor with stadium style seating, high gabled ceilings and….is that an airplane?! Yes, yes it is. So, yeah, +1 point for this unique backdrop! Secondly, I know this was technically Nicole and Bobby’s big day, but they both made it very clear that Ava and Ella were basically going to steal the show because they’re little wild pixie rockstars in twirly dresses that’re fierce and funny and I almost melted in to a puddle when they saw their mama in her wedding dress. +1, tiny adorable humans. And then we’ve got eye contact. Y’all, my monitor has had sparks flying out of it while editing these photos - the way Nicole and Bobby talk to each other without saying a single word is truly an awesome thing to behold and to photography. The intensity of that gaze, the evident love and respect was something I picked up the first time I met them, but it was truly magnified on this day. Seriously, clock all these portraits of the two of them being completely grounded within each other. +1 for radiating that good love. 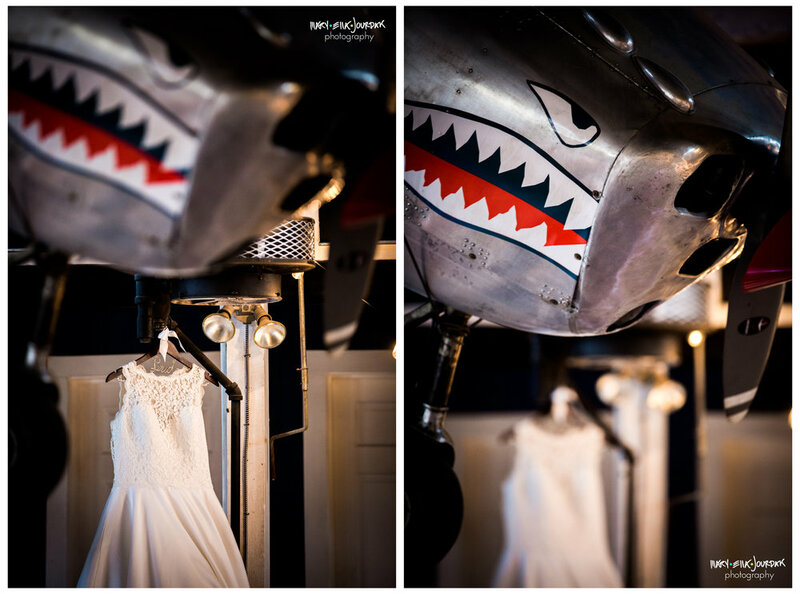 Let’s do a +1 for familiarity, because I’ve photographed three weddings out of their six attendants. Travis is the amazing father to my goddaughter and the husband to one of my oldest and dearest friends Rachael, Bobby officiated Laura and Niki’s wedding, and I got to meet the whole Bach clan last year at Michelle and Michael’s wedding. Nicole and Bobby’s officiant Renee is also a rockstar vendor that I always recommend to couples on the look out, and Missy, who coordinated everything, is a KI local I’ve known for a hot second. To say that I love and was so excited to work with this group of people is a wild understatement. 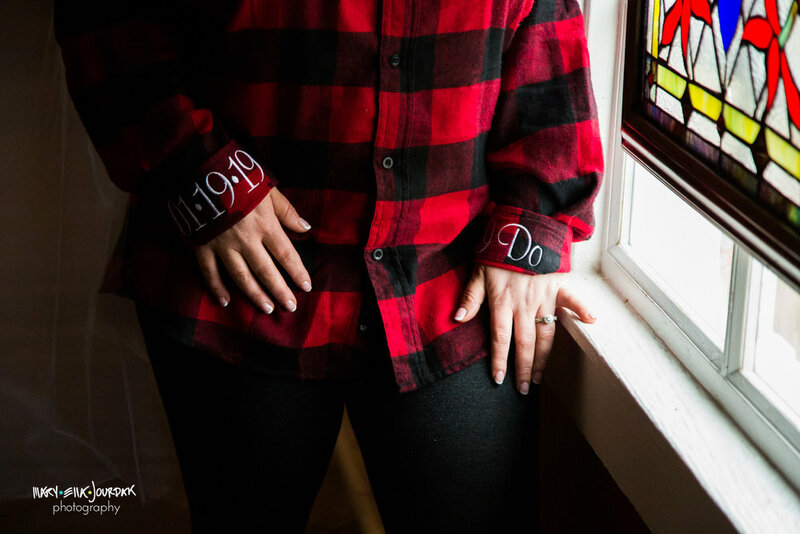 Their ceremony was incredibly personal, and both Nicole and Bobby ended their vows with literally the same line with zero knowledge of the other’s intentions. +1 for serendipity. 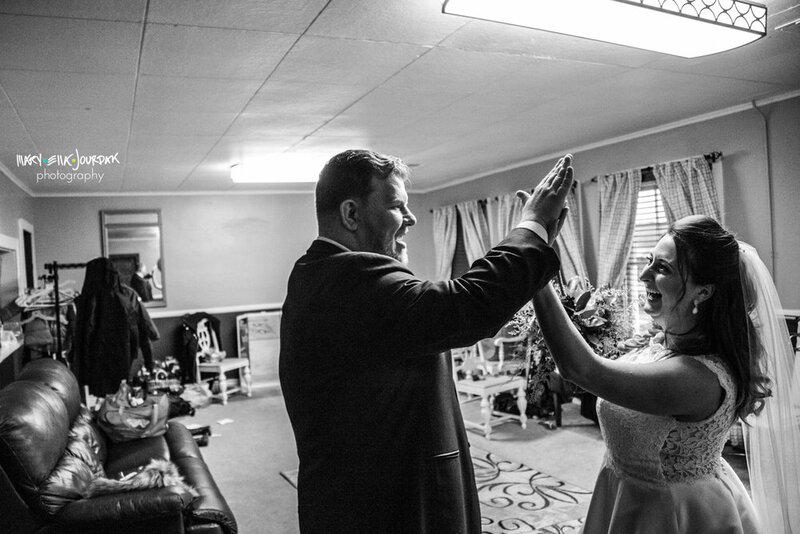 Quite possibly my most favorite wedding memory that I’ve ever captured was this one, where everyone is giddy and giggly in the first minute after they had been officially pronounced husband and wife. Ava, older sister to Ella, and generally a tough as nails babe, walked in to the room crying. Nicole noticed immediately, and leaned in to ask what was troubling her. But there was no trouble - Ava was crying tears of joy, and said that she was overwhelmed with happiness. Immediately, the room went teary-eyed. Honestly, I cry at just about every wedding - I feel things in big ways, and it never gets in the way of shooting. I was legitimately ugly crying with fogged up glasses and a snotty nose, and I’ve never been so glad that my ability to shoot while mostly blind is so on-point. +1 for the vulnerability and love of kiddos. And another +1 for their ability to literally jump in to Spinny Dress Mode Yay about 30 seconds later. Respect for that emotional flexibility, Ava. What else? 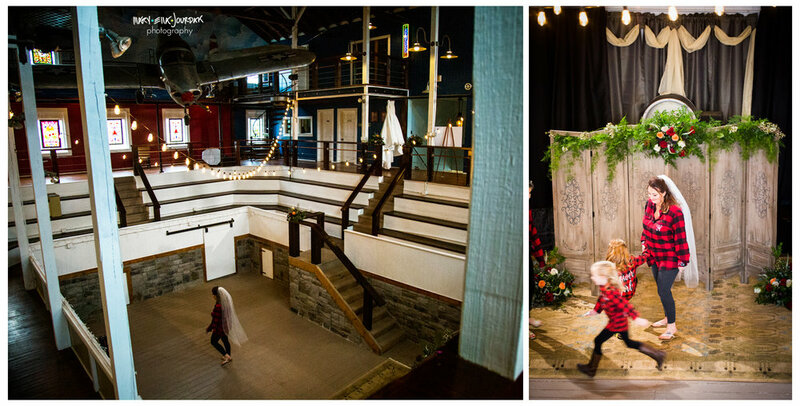 +1 for the amazingly rich florals and golden lights and warm tones throughout the barn, and seriously THAT CAKE. We didn’t get snow on the big day, but this cake looked like a winter wonderland - so gorgeous! +1 point for incredible speeches that had the entire room laughing hysterically, crying again, and then cracking right back up, and another +1 for an amazing photobooth chock full of props that was in constant use all night. Nicole’s dad gets +1 for a little limited mobility but still being the best dancer on the floor while seated, and another +1 for his walker being a fabulous dance partner. Oh. Maaaaaahhhhh. GOODNESS. THIS. FREAKING. ADVENTURE. YOU. GUYS. There isn’t enough caps lock in the world to express all the magic and excitement I have for y’all with this one, so let’s just jump right on in (and I’ll try not to over capitalize too much. no promises, seriously. you’ll understand). Let’s start with a phone call I got in summer while lounging by a pool, and then I’ll get in to why there’s cats in a car, okay? I got a jingle from some sweet friends very politely asking if I’d be “up for” a wedding in Colorado that was a-total-secret-so-shh-but-also-it’s-gonna-be-somewhere-we-don’t-know-quite-exactly-where-yet-and-it-might-be-a-sunrise-thing-or-maybe-at-night-maybe-under-the-stars-maybe-on-top-of-a-mountain-or-a-forest-or-something-we-aren’t-sure-yet. Up for? UP FOR?! Yes, I was sure to emphatically emphasis that this is literally a dream job proposal being tossed my way, yes yes YES YES YES. (damn, there goes my promise to not caps lock so much…). I hung up the phone and promptly proceeded to do a front flip in to said pool because I was so all about this. Fast forward to November 2nd - I’m only slightly jetlagged (shoutout to Aer Lingus for bumping my flight home from Scotland a full 24 hours and giving me a whooping day and a half to be home and prepare for this next adventure), but mostly just holymoly so excited to be in Colorado for the first time and trucking south from Denver with Katie and Tyler, and Sam and Bella, who weren’t too terribly upset by my presence in the backseat. I believe I said “woooOOOOooooOOOooooOOOOooow” about a hundred thousand times in the 6-ish hour drive because, y’all, Colorado is stunning. And I know I’m late to the bandwagon and you probably already know this but holy crap! My jaw was on the floor of the car, all the while I was getting more and more excited for the potential of the magic we’d be making for Katie & Tyler’s I-Dos. Also, how scenic of an emergency pull-over-and-pee-here spot is this? 3) there had to be water of some sort. Okay, easy enough? Ehhh. If not for the help of the concierge at the Springs Resort, we’d have been honestly clueless. She suggested a pond right in town that was cute enough, but Katie and Tyler weren’t sold on it, and we sort of desperately took her advice to explore the reservoir in nearby San Juan National Forest. Things were getting a little panicked, and a pinch desperate. It was getting dark, and the ‘half hour’ drive to the supposed reservoir had us hunting for small peaks we could hike up early in the morning, but we kept driving on. We were definitely in the National Park, which was heartening, but the winding, dark roads made for slow going. Finally, just as we had to launch in to Bride Calming Mode, we got there. And this? This calm expanse of water with snow-capped mountains in the background, where the sun would rise perfectly up and over? This was it. As with all good things, this was so worth fighting back that mounting panic and stress. We headed back to town, grabbed a few adult beverages and snacks to nibble on and got to enjoy soaking in the hot springs that Pagosa is known for. That was certainly relaxing, but it was back to prep mode for the rest of the night. Because this was truly such an intimate group, it was all hands on deck. I am only slightly remiss that I didn’t think to take a picture of myself clambering through the foliage outside of our hotel rooms to gather greenery for a bouquet and a boutonnière. 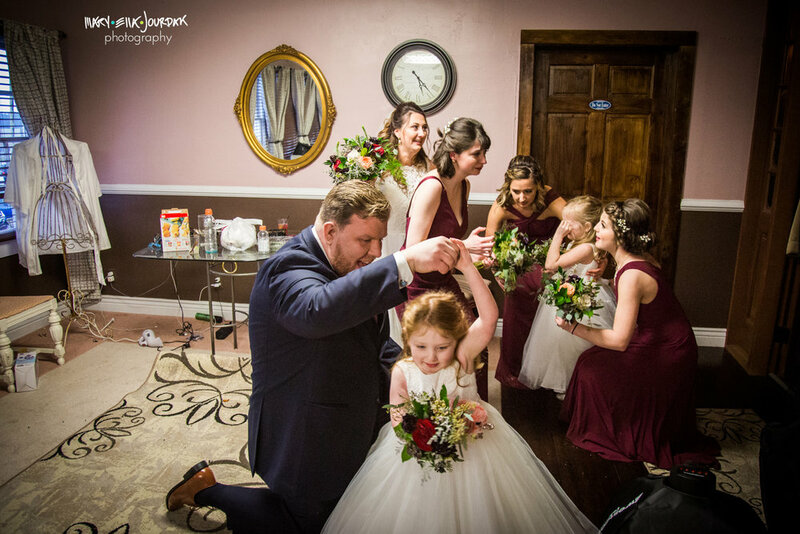 It’s not every wedding your photographer gets to take credit as a stand-in florist and hair dresser, but I was more than excited to help. We braided and pinned hair, arranged florals, and hustled on in to bed for a few hours of sleep before a very early morning wake up call. Groggy, but deliriously excited because IT WAS SNOWING (!!!!!!! ), we had a sweet little first look within the springs. I can’t tell you how much I love that deliciously moody mist, mmmm-mm! We piled in to the SUV and headed northwest with a much better idea of time + distance, but also with a great spot to hop out and get a photo under the truly incredible night sky. Even with a waning gibbous moon hanging in the sky, there were plenty of sparkling stars on this cold, clear morning. We got to the reservoir with plenty of time to settle in and further plan. Thanks to my handy-dandy tripod, there were lots of photos making the most of the first hints of morning sun. Intimate was the name of the game. It was nearly silent on this morning, and though there may have only been five of us physically present, we posted up a framed photograph of Katie’s brother Harrison beside the water line and had more than a few precious moments to reflect on the fact that he was undeniably swirling about in all of this joy and excitement, and was absolutely felt by all of us. Thanks for the good vibes, H.
Cue me internally screaming with joy at how amazing and adventurous these guys are. With the snow swirling, we hopped to - we cried, we laughed. In a perfect measure of brotherly love, Harrison decided to faceplant his frame midway through Katie and Tyler’s softly exchanged vows. It was short, it was sweet, it was…cold. Tyler had to steady his shaking hands so Katie could slip his ring on. And that was that, inside of this silvery swirling snow globe, they were married! And suddenly, the clouds broke a bit, and this most glorious deluge of color flooded the sky. Thanks for celebrating with us, Mother Nature! I shooed Katie and Tyler back in to the car to warm up while I stood agog at this scenery. Truly spectacular - I couldn’t have dreamed up a more beautiful place. I had also decided to play caterer as well, and while not entirely able to sneak a wedding cake in my camera gear, mini donuts and champagne are one hell of a way to celebrate this wildly successful morning. While I know I was hesitant to leave this idyllic spot that had served us so well, there was an entire national park at our fingertips, so we headed off to make some more morning magic in the newly risen sun that was oh-so-warm to us little chilly revelers. Where there had been nothing but a slight dusting on one of the far off mountain peaks the night before, the fresh snow was truly a wonderland to hang out in. Did I mention Katie had on hiking boots and tights under her dress? 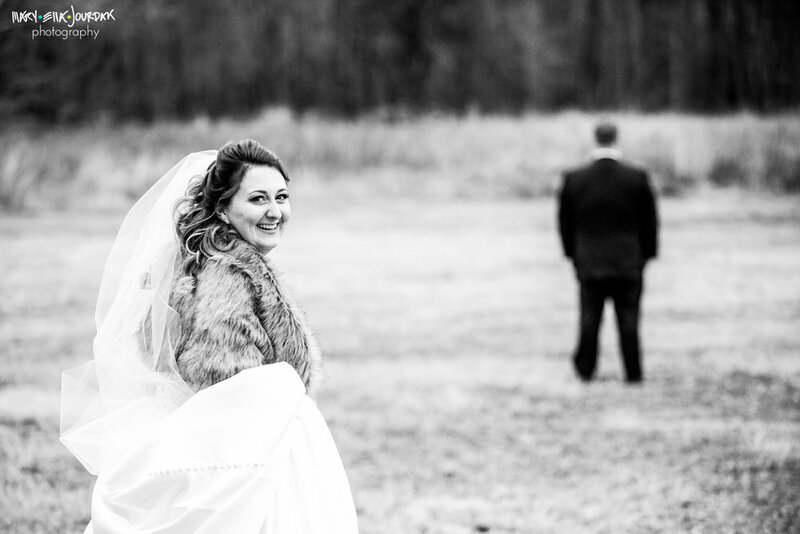 That’s a badass bride move if ever I’ve seen one - she had zero issue with stomping through knee high snowy grass for shots. We had some serous off-roading moments to get in to some gorgeous backdrops - big ups to Tyler’s fearless driving skills, and strong choice to avoid knee-deep puddles . Our stomachs were all audibly rumbling after being up and at ‘em for so long with only tiny pastries and bubbles and excitement to sustain us, and while I stomped on my own toes to resist the urge for yet another “okay, this is the last spot, I promise!” - we really had one last stop. You can’t hate on a dramatic cliff top, even when you’re starting to get hangry. We all devoured a huge breakfast, then took delicious naps, hung out in hot springs, and then ran around sleepy little Pagosa Springs that night to celebrate over beer and pool and Mexican food. Conventional? Absolutely not. AmazingstupendouswowowowIdon’tevenhavethewords? You bet your sweet patoot. What's the perfect fall wedding? Well, besides any one that happens in the fall (can you tell I'm partial?? ), there's something magical with golden sunsets, brisk weather, crunchy leaves, jewel tones, sparkling lights, textures and patterns and colors in the autumn palate - yes please! Dorothy and Matt's big day was nothing short of all the loveliest bits about fall, and - okay, yeah - maybe the weather was a little bit HOLYCRAPIT'SCOLDOUTHERE, but for as extreme of a temperature dip, D+M and allllll of their friends and family kept it sweet and spicy and a little silly all day long. Even with a little bit of a hectic schedule with timing portraits and the general rush that happens at every wedding, Dorothy and Matt were cool, but most importantly, so ridiculously blissfully happy. Seriously, having known Dorothy since high school, I thought she had one of the most infectious grins I've ever seen, but Matt? Well, she certainly found the perfect match there. After an indoor ceremony at the Governor Calvert House, we ventured with the family + wedding party out to State Circle for some portraits before hitting a striking sunset on (and under!) the Naval Academy bridge. There was a quick chance to thaw out back at the reception (seriously, Dorothy - mad props to you for being out in such biting weather in a strapless gown! ), and then it was on to the p.a.r.t.y.! 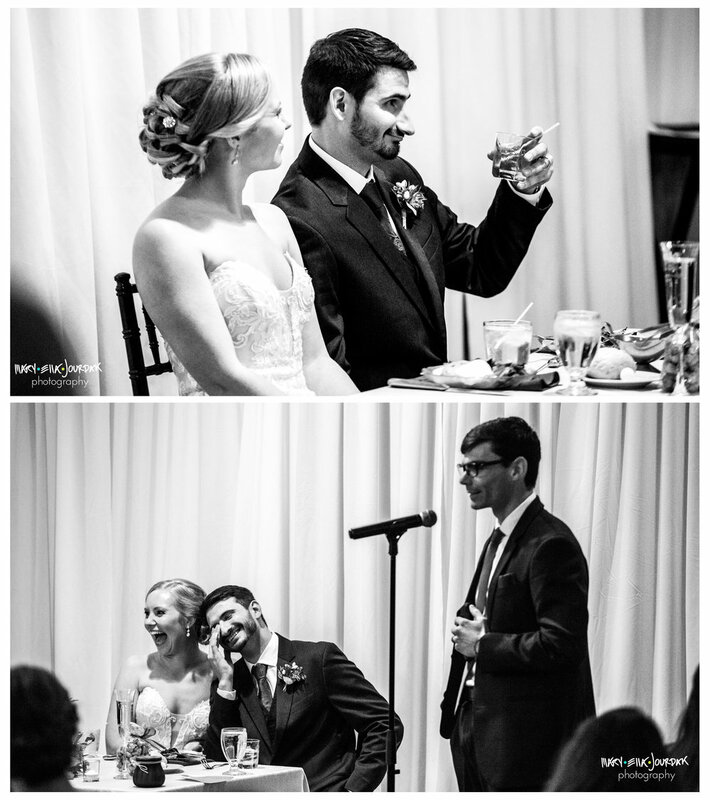 Besides being a group that knows how to tear up a dance floor, I (and just about everyone else in the reception) legitimately was in tears from laughing so hard at the speeches delivered. We can’t repeat what was said, but props to brothers and closest friends for making our bellies ache with ridiculous recounts.